The Israeli–Lebanese conflict, widely referred as the South Lebanon conflict, was a series of military clashes involving Israel, Lebanon and Syria, the Palestine Liberation Organization, as well as various non-state militias acting from within Lebanon. The Palestine Liberation Organization (PLO) recruited militants in Lebanon from among the families of Palestinian refugees who had been expelled or fled due to the creation of Israel in 1948. After the PLO leadership and its Fatah brigade were expelled from Jordan for fomenting a revolt, they entered Lebanon and the cross-border violence increased. Meanwhile, demographic tensions over the Lebanese National Pact led to the Lebanese Civil War (1975–1990). Israel's 1978 invasion of Lebanon pushed the PLO north of the Litani River, but the PLO continued their campaign against Israel. Israel invaded Lebanon again in 1982 and forcibly expelled the PLO. Israel withdrew from most of Lebanon in 1985, but kept control of a 12-mile security buffer zone, held with the aid of proxy militants in the South Lebanon Army (SLA). In 1985, Hezbollah, a Lebanese Shia radical movement sponsored by Iran, called for armed struggle to end the Israeli occupation of Lebanese territory. When the Lebanese civil war ended and other warring factions agreed to disarm, Hezbollah and the SLA refused. Combat with Hezbollah weakened Israeli resolve and led to a collapse of the SLA and an Israeli withdrawal in 2000 to their side of the UN designated border. Citing Israeli control of the Shebaa farms territory, Hezbollah continued cross border attacks intermittently over the next six years. Hezbollah now sought the release of Lebanese citizens in Israeli prisons and successfully used the tactic of capturing Israeli soldiers as leverage for a prisoner exchange in 2004. The capturing of two Israeli soldiers by Hezbollah ignited the 2006 Lebanon War. Its ceasefire called for the disarmament of Hezbollah and the respecting of the territorial integrity and sovereignty of Lebanon by Israel. As of 2015, the situation remained generally calm, but both sides violated the ceasefire agreements; Israel by making near-daily overflights over Lebanese territory, and Hezbollah by not disarming. Zones of French and British influence and control imagined by the 1916 Sykes–Picot Agreement. The territory of what would become the states of Israel and Lebanon was once part of the long-lived Ottoman Empire (1299–1922) until its defeat in World War I. As a result of Sinai and Palestine Campaign in 1917, the British occupied Palestine and parts of what would become Syria. French troops took Damascus in 1918. The League of Nations officially gave the French the Mandate of Syria and the British the Mandate of Palestine after the 1920 San Remo conference, in accordance with the 1916 Sykes–Picot Agreement. The largely Christian enclave of the French Mandate became the French-controlled Lebanese Republic in 1926. Lebanon became independent in 1943 as France was under German occupation, though French troops did not completely withdraw until 1946. The rise of anti-Semitism in Europe, culminating in the Holocaust during World War II, had meant an increase of Jewish immigrants to a minority Jewish, majority Arab Mandate. During the 1936–39 Arab revolt and thereafter the British increasingly came to rely on Jewish police forces to help maintain order. Eventually, the resultant rise in ethnic tensions and violence between the Arabs and Jews due to Jewish immigration and collaboration would force the British to withdraw in 1947. (The area of their mandate east of the Jordan river had already become the independent state of Jordan in 1946.) The United Nations General Assembly developed a gerrymandered 1947 UN Partition Plan, to attempt to give both Arabs and Jews their own states from the remains of the British Mandate; however, this was rejected by the Arabs, and the situation quickly devolved into a full-fledged civil war. In 1948, the Lebanese army had by far the smallest regional army, consisting of only 3,500 soldiers. At the prompting of Arab leaders in the region, Lebanon agreed to join the other armies that were being assembled around the perimeter of the British Mandate territory of Palestine for the purpose of invading Palestine. Lebanon committed 1,000 of these soldiers to the cause. The Arab armies waited for the end of the Mandate and the withdrawal of British forces, which was set for 15 May 1948. Israel declared its independence on 14 May 1948. The next day, the British Mandate officially expired and, in an official cablegram, the seven-member Arab League, including Lebanon, publicly proclaimed their aim of creating a democratic "United State of Palestine" in place of the United Nations Partition Plan for Palestine. The League soon entered the conflict on the side of the Palestinian Arabs, thus beginning the international phase of the 1948 Arab–Israeli War. Egypt, Lebanon, Syria, Transjordan, and Iraq declared war on the new state of Israel. They expected an easy and quick victory in what came to be called the 1948 Arab–Israeli War. The Lebanese army joined the other Arab armies in the invasion. It crossed into the northern Galilee. By the end of the conflict, however, it had been repulsed by Israeli forces, which occupied South Lebanon. Israel signed armistice agreements with each of its invading neighbors. The armistice with Lebanon was signed on 23 March 1949. As part of the agreement with Lebanon, Israeli forces withdrew to the international border. By the conclusion of that war, Israel had signed ceasefire agreements with all of the neighbouring Arab countries. The territory it now controlled went well beyond what had been allocated to it under the United Nations Partition Plan, incorporating much of what had been promised to the Palestinian Arabs under the Plan. However, it was understood by all the state parties at the time that the armistice agreements were not peace treaties with Israel, nor the final resolution of the conflict between them, including the borders. After the war, the United Nations estimated 711,000 Palestinian Arabs, out an estimated 1.8 million dwelling in the Mandate of Palestine, fled, emigrated or were forced out of Israel and entered neighboring countries. By 1949, there were 110,000 Palestinian Arabs in Lebanon, moved into camps established by and administered by the United Nations Relief and Works Agency for Palestine Refugees in the Near East. With the exception of two camps in the Beirut area, the camps were mostly Muslim. Lebanese Christians feared that the Muslim influx would affect their political dominance and their assumed demographic majority. Accordingly, they imposed restrictions on the status of the Palestinian refugees. The refugees could not work, travel, or engage in political activities. Initially the refugees were too impoverished to develop a leadership capable of representing their concerns. Less democratic regimes also feared the threat the refugees posed to their own rule, but Lebanon would prove too weak to maintain a crackdown. The Palestine Liberation Organization (PLO) recruited militants in Lebanon from among the families of Palestinian refugees who had left Israel in 1948. Despite sharing in the ongoing border tensions over water, Lebanon rejected calls by other Arab governments to participate in the 1967 Six-Day War. Militarily weak in the south, Lebanon could not afford conflict with Israel. Nevertheless, the loss of additional territory radicalized the Palestinians languishing in refugee camps hoping to return home. The additional influx of refugees turned Palestinian camps throughout the Middle East into centers of guerrilla activity. The PLO, from its inception in 1964 by Ahmed Shukeri, began executing numerous terror attacks on Israeli civilians in attempt to fulfill its mission charter's vow to pursue in "the path of holy war (al-jihad)" until the establishment of a Palestinian State in place of the State of Israel. The series of attacks (such as the 1966 bombings in Romema, Jerusalem) drove the Israeli Defense Forces (IDF) to strike in return, instigating the long and still unresolved struggle between the PLO and the IDF. From 1968 onwards, the Palestine Liberation Organization (PLO) began conducting raids from Lebanon into Israel, and Israel began making retaliatory raids against Lebanese villages to encourage the Lebanese people to themselves deal with the fedayeen. After an Israeli airline was machine-gunned at Athens Airport, Israel raided the Beirut International Airport in retaliation, destroying 13 civilian aircraft. The unarmed citizenry could not expel the armed foreigners, while the Lebanese army was too weak militarily and politically. The Palestinian camps came under Palestinian control after a series of clashes in 1968 and 1969 between the Lebanese military and the emerging Palestinian guerrilla forces. In 1969 the Cairo Agreement guaranteed refugees the right to work, to form self-governing committees, and to engage in armed struggle. "The Palestinian resistance movement assumed daily management of the refugee camps, providing security as well as a wide variety of health, educational, and social services." On 8 May 1970, a PLO faction, called the Democratic Front for the Liberation of Palestine, (DFLP) crossed into Israel and carried out the Avivim school bus massacre. In 1970, the PLO attempted to overthrow a reigning monarch, King Hussein of Jordan, and following his quashing of the rebellion in what Arab historians call Black September, the PLO leadership and their troops fled from Jordan to Syria and finally Lebanon, where cross-border violence increased. With headquarters now in Beirut, PLO factions recruited new members from the Palestinian refugee camps. South Lebanon was nicknamed "Fatahland" due to the predominance there of Yasser Arafat's Fatah organization. With its own army operating freely in Lebanon, the PLO had created a state within a state. By 1975, more than 300,000 Palestinian displaced persons lived in Lebanon. In reaction to the 1972 Munich massacre, Israel carried out Operation Spring of Youth. Members of Israel's elite Special Forces landed by boat in Lebanon on 9 April 1973, and with the aid of Israeli intelligence agents, infiltrated the PLO headquarters in Beirut and assassinated several members of its leadership. In 1974 the PLO altered its focus to include political elements, necessary for a dialogue with Israel. Those who insisted on a military solution left to form the Rejectionist Front, and Yassir Arafat took over the PLO leadership role. The Popular Front for the Liberation of Palestine – General Command, which split from the PLO in 1974, carried out the Kiryat Shmona massacre in April of that year. In May 1974, the DFLP crossed again into Israel and carried out the Ma'alot massacre. The Lebanese Civil War (1975–1990) was a complex conflict in the form of various factions and shifting alliances between and among Lebanese Maronite Catholics, Lebanese Muslims, Palestinian Muslims, Lebanese Druze, and other non-sectarian groups. Governmental power had been allotted among the different religious groups by the National Pact based partially on the results of the 1932 census. Changes in demographics and increased feelings of deprivation by certain ethnic groups, as well as Israeli–Palestinian clashes in the south of the county all contributed to the outbreak of the Lebanese Civil War. Beginning in May 1976, Israel supplied the Maronite militias, including the Lebanese Forces, led by Bachir Gemayel, with arms, tanks, and military advisers. The border between Israel and Lebanon was at this time was nicknamed the Good Fence. Fearing loss of commercial access to the port of Beirut, in June 1976 Syria intervened in the civil war to support the Maronite dominated government, and by October had 40,000 troops stationed within Lebanon. On 11 March 1978, eleven PLO militants made a beach landing 30 km. south of Haifa, Israel, where they seized a bus, full of people, killing those on board in what is known as the Coastal Road massacre. By the end of the incident, nine hijackers and 38 Israeli civilians (including 13 children) were dead. In response, on 14 March 1978, Israel launched Operation Litani occupying southern Lebanon, except for the city of Tyre, with 25,000 troops. The objective was to push the PLO away from the border and bolster a Lebanese Christian militia allied with Israel, the South Lebanese Army (SLA). However, the PLO concluded from the name of the operation that the invasion would halt at the Litani River and moved their forces north, leaving behind a token force of a few hundred men. As a result, the casualties were almost all civilians. On 19 March 1978, the United Nations Security Council passed Resolution 425, which called for Israel's immediate withdrawal and the establishment of a United Nations Interim Force in Lebanon. When Israel forces withdrew later in 1978, they turned over its positions in Lebanon to the South Lebanon Army which would continue fighting as a proxy for Israel against the PLO until Israel drove the PLO out of Lebanon in 1982. On 22 April 1979, Samir Kuntar and three other members of the Palestine Liberation Front, a sometimes faction of the PLO, landed in Nahariya, Israel from Tyre, Lebanon by boat. After killing a police officer who had discovered their presence, they took a father and his daughter hostage in an apartment building. After fleeing with the hostages from police back to the beach, a shootout killed one policeman and two of the militants. Kuntar then executed the hostages before he and the remaining invader were captured. In April 1981, the United States brokered a cease-fire in southern Lebanon among Israel, Syria and the PLO. The 1982 Lebanon war began on 6 June 1982, when Israel invaded again for the purpose of attacking the Palestine Liberation Organization. The Israeli army laid siege to Beirut. During the conflict, according to Lebanese sources, between 15,000–20,000 people were killed, mostly civilians. According to American military analyst Richard Gabriel, between 5,000–8,000 civilians were killed. Fighting also occurred between Israel and Syria. The United States, fearing a widening conflict and the prestige the siege was giving PLO leader Yasser Arafat, got all sides to agree to a cease-fire and terms for the PLO's withdrawal on 12 August. The Multinational Force in Lebanon arrived to keep the peace and ensure PLO withdrawal. The PLO leadership retreated from Beirut on 30 August 1982 and moved to Tunisia. The National Assembly of Lebanon narrowly chose Bachir Gemayel as president-elect, but when he was assassinated on 14 September 1982, Israel reoccupied West Beirut and Maronite militias carried out the Sabra and Shatila massacre. In 1983, the United States brokered the May 17 Agreement, a peace treaty between Israel and Lebanon in all but name. The agreement called for a staged Israeli withdrawal over the next eight to twelve weeks and the establishment of a "security zone" to be patrolled by the Lebanese army in southern Lebanon, but was conditional on Syrian withdrawal as well. In August 1983, as Israel withdrew from the areas southeast of Beirut to the Awali River, Lebanese factions clashed for control of the freed territory. In February 1984, the Lebanese Army collapsed, with many units forming their own militias. The National Assembly of Lebanon, under pressure from Syria and Muslim militias, cancelled the 17 May Agreement on 5 March 1984. On 15 January 1985, Israel adopted a phased withdrawal plan, finally retreating to the Litani River to form the 4–12 kilometer (2.5–9 mi) deep Israeli Security Zone (map at) while using the native South Lebanese Army militia to help control it. Map of southern Lebanon, featuring the Blue Line, UNIFIL zone, and Litani River (2006). On 16 February 1985, Shia Sheik Ibrahim al-Amin declared a manifesto in Lebanon, announcing a resistance movement called Hezbollah, whose goals included combating the Israeli occupation. During the 1982-2000 South Lebanon conflict the Hezbollah militia waged a guerrilla campaign against Israeli forces occupying Southern Lebanon and their South Lebanon Army proxies. "Throughout the period of 1985–92, there were very few limited exchanges between Israeli and Hezbollah or Amal forces in southern Lebanon", and "with the exception of 1988, during which twenty-one Israeli soldiers were killed, the number of Israeli fatalities per year over this period was in the single-digit figure". By the end of 1990 the Lebanese Civil War was effectively over. In March 1991, the National Assembly of Lebanon passed an amnesty law that pardoned all political crimes prior to its enactment, and in May 1991, the militias—with the important exceptions of Hezbollah and the SLA—were dissolved, and the Lebanese Armed Forces began to slowly rebuild themselves as Lebanon's only major non-sectarian institution. In 1992, Hezbollah won ten out of 128 seats in the Lebanese National Assembly. On 25 July 1993 Israel launched Operation Accountability, known in Lebanon as the Seven-Day War. The given reason was to retaliate for the death of IDF soldiers in the "security zone" which Israel had created in 1982 in southern Lebanon to protect its northern borders from both Hezbollah and the Popular Front for the Liberation of Palestine – General Command. On 10 July Hezbollah undertook an operation in which 5 Israeli soldiers were killed; a further attack on 19 July caused several further casualties to the IDF, and on the 23rd. another Israeli soldier was killed. Cross-border raids were frequent from both sides, and Operation Accountability arose from the escalation in hostilities. Thousands of buildings were bombed, resulting in 120 dead and 500,000 displaced civilians. Israeli forces also destroyed infrastructure such as power stations and bridges. According to Michael Brecher, the aim of Operation Accountability was to precipitate a large flight of Lebanese refugees from the south towards Beirut and thereby put the Lebanese government under pressure to rein in Hezbollah. Hezbollah retaliated with rocket attacks on Israeli villages, though inflicting significantly fewer casualties. After Lebanon complained to the UN, the Security Council called on Israel to withdraw its occupying forces from Lebanese territory. A truce agreement brokered by the US secured an Israeli undertaking to stop attacks north of its security zone in Lebanon, and a Hezbollah agreement to desist from firing rockets into Israel. 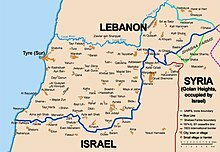 On 11 April 1996 Israel initiated Operation Grapes of Wrath, known in Lebanon as the April War, which repeated the pattern of Operation Accountability., which was triggered by Hezbollah Katyusha rockets fired into Israel in response to the killing of two Lebanese by an IDF missile, and the killing of Lebanese boy by a road-side bomb. Israel conducted massive air raids and extensive shelling in southern Lebanon. 106 Lebanese died in the shelling of Qana, when a UN compound was hit in an Israeli shelling. The conflict ended on 26 April 1996 with the Israeli-Lebanese Ceasefire Understanding in which both Hezbollah and Israel agreed to, respect the "rules of the game" and forgo attacks on civilians. From 1985 through 2000, Israel continued to fund the South Lebanon Army. In January 2000, Hezbollah assassinated the man responsible for day to day SLA operations, Colonel Akel Hashem. The Israeli Air Force, in apparent response, on 7 February struck Lebanon's civilian infrastructure, including power stations at Baalbek, Deir Nbouh and Jambour. Eighteen people were reported to have been injured. Following its declaration of intent to implement UNSC Resolution 425 on 1 April 1998, and after the collapse of the South Lebanon Army in the face of a Hezbollah onslaught, Israel declared 24 May 2000 that they would withdraw to their side of the UN designated border, the Blue Line, 22 years after the resolution had been approved. The South Lebanon Army's equipment and positions largely fell into the hands of Hezbollah. Lebanon celebrates 25 May, Liberation Day, as a national holiday. In September 2000, Hezbollah forged an electoral coalition with the Amal movement. The ticket swept all 23 parliamentary seats allotted for south Lebanon in that region's first election since 1972. On 7 October 2000, three Israeli soldiers – Adi Avitan, Staff Sgt. Benyamin Avraham, and Staff Sgt. Omar Sawaidwere – were abducted by Hezbollah across the Israeli–Lebanese border. The soldiers were killed either during the attack or in its immediate aftermath. After Hezbollah killed an Israeli soldier in an attack on an armored bulldozer that had crossed the border to clear bombs on 20 January 2004, Israel bombed two of the group's bases. On 29 January 2004, in a German-mediated prisoner swap, one time Amal security head Mustafa Dirani, who had been captured by Israeli commandos in 1994, and 22 other Lebanese detainees, about 400 Palestinians, and 12 Israeli-Arabs were released from Israeli prisons in exchange for Israeli businessman Elchanan Tenenbaum, who had been captured by Hezbollah in October 2000. The remains of 59 Lebanese militants and civilians and the bodies of the three Israeli soldiers captured on 7 October 2000 were also part of the exchange. Hezbollah requested that maps showing Israeli mines in South Lebanon be included in the deal. In May 2004, Hezbollah militiamen killed an Israeli soldier along the border within the Israeli held Shebaa Farms. Between July and August 2004 there was a period of more intense border conflict. Hezbollah said the clash began when Israeli forces shelled its positions, while Israel said that Hezbollah had started the fighting with a sniper attack on a border outpost. On 2 September 2004 Resolution 1559 was approved by the United Nations Security council, calling for the disbanding of all Lebanese militia. An armed Hezbollah was seen by the Israeli government as a contravention of the resolution. The Lebanese government differed from this interpretation. Syrian troops withdrew from Lebanon in April 2005. On 26 May 2006, a car bomb killed Palestinian Islamic Jihad leader Mahmoud Majzoub and his brother in Sidon. Prime Minister of Lebanon Fuad Saniora called Israel the prime suspect, but Israel denied involvement. On 28 May 2006, rockets were fired from Lebanon into Israel. According to an interview with Walid Jumblatt in World Net Daily, "agents" of Iran and Syria were responsible for these attacks. Hours later, Israel responded by bombing suspected militant rocket launch sites and exchanging fire across the border. The United Nations negotiated a ceasefire the same day. On 10 June 2006 the Lebanese army arrested members of an alleged Israeli spy ring, including Mahmoud Rafeh, his wife, and two children. Police discovered bomb-making materials, code machines and other espionage equipment in his home. Rafeh reportedly confessed to the Majzoub killings and to working for Mossad, and admitted that his cell had assassinated two Hezbollah leaders in 1999 and 2003 and the son of Ahmed Jibril, leader of the Popular Front for the Liberation of Palestine-General Command, in 2002. Former Lebanese Minister Walid Jumblatt, an outspoken critic of Hezbollah, suspected that the exposure of the spy ring was a Hezbollah fabrication. Since the 2006 Lebanon War, there have been only isolated incidents. On 7 February 2007, there was an exchange of gunfire near Avivim between the Lebanese Armed Forces and the Israel Defense Forces, culminating in the firing of two IDF tank shells over the border. There were no injuries on either side. The UN Secretary-General stated it was first armed incident since the end of the last war and that the first fire was by the Lebanese army without any provocation since the IDF was operating inside Israeli territory. On 3 August 2010, IDF forces clashed with the Lebanese army. The clash began when the Lebanese army attacked an IDF post with sniper fire, killing an Israeli officer and wounding another. IDF troops at the scene returned fire, and Israel retaliated with air and artillery strikes at Lebanese army positions, killing two Lebanese soldiers and wounding five. A Lebanese journalist was also killed, and one was wounded. The Lebanese claimed they were responding to an Israeli violation of their sovereignty when Israeli troops crossed the border and began cutting down a tree that was in Lebanese territory. The Israelis denied violating Lebanese sovereignty and claimed the tree was in their territory. The United Nations Interim Force in Lebanon (UNIFIL) confirmed Israel's position, adding that Israel had informed them of the border work beforehand. However, the Syrian, Egyptian, and Lebanese governments hold the IDF accountable for the breach the UN resolution. On 1 August 2011, Israeli soldiers and Lebanese soldiers exchanged fire. At first it was reported that a Lebanese soldier was killed, but UNIFIL later said no one was killed. UNIFIL findings showed that Israeli troops had not crossed the border, and there was no cause for the clash. On 16 December 2013, a Lebanese soldier, acting without orders, fired at a civilian vehicle being driven by an Israeli naval officer along the border, killing him. The soldier then fled the scene and turned himself in to Lebanese authorities. Shortly afterward, IDF troops operating on the Israeli side of the border in the area where the officer was killed fired at what an IDF spokeswoman called "suspicious movement" on the Lebanese side of the border, hitting two Lebanese soldiers. On 7 August 2013 four Israeli soldiers were wounded in a landmine explosion allegedly by Hezbollah. The Lebanese army said that the soldiers were 400 metres (1,300 ft) into Lebanese territory. On 14 March 2014, After a detonation of an explosive device in the area of Mt. Dov that wounded three soldiers, the Israeli army fired a number of shells at the village of Kafr Kila in southern Lebanon. In retaliation for the detonation of the explosive device, an Israeli armored force attacked a Hezbollah position in the city of Halata near the Shebaa Farms. A few hours after the incident, the Islamic State of Iraq and al-Sham (ISIS) announced that it was taking responsibility for the attack on the Lebanese border. On 18 January 2015, an airstrike on a convoy in the Quneitra District of Syria took place, killing six Hezbollah members and at least one IRGC officer. The UN observers attributed the attack to Israel, which did not officially comment. In response, on 28 January, Hezbollah fired missiles at Israeli convoy in the Shebaa farms disputed territory in the Israeli occupied Golan Heights, killing two soldiers. IDF fired shells into southern Lebanon, killing one Spanish peacekeeper. On 17 June 2007, an unknown militant group fired two rockets from Lebanon into northern Israel, an action which the UN condemned as a serious violation of the ceasefire. Hezbollah denied involvement in the incident, and Israel emphasized that it would restrain itself from responding by force. Saniora pledged that "The state ... will spare no effort in uncovering those who stand behind this incident." Citing its intelligence and military sources, Debkafile claimed that the shelling was carried out by an order of the Syrian military intelligence by an unknown extremist Palestinian organization called Ansar Allah, and that the launching point was determined by Hezbollah intelligence officers who maintain operational ties and provide weapons to the Ansar Allah fighters. On 11 September 2009, at approximately 15:45, there were explosions in the Nahariya area and the western Galilee without an alarm. Two rockets fell in open areas, and no injuries or damage were reported. The IDF responded by firing at the launching sites in southern Lebanon. On 29 November 2011, rockets were fired from Lebanon into Israeli territory and exploded in the western Galilee without causing casualties, but property was damaged. In response, the IDF responded by firing at the sources of the fire in Lebanon. Israeli firefighters took control of the fire that broke out in one of the centers. Israel estimated that the rockets were fired by a Palestinian organization. On 24 February 2014, the official Lebanese news agency reported that Israeli warplanes carried out two attacks near the Syrian-Lebanese border in the Nabi Sheet area. The Voice of Lebanon radio reported that the target of the attack was Hezbollah convoys, which transferred very advanced rocket weapons from Syria to the organization's bunker in the northern Lebanon Valley. Al-Arabiya reported that the target of the attack was Hezbollah facilities inside Lebanon, near the border and that several Hezbollah members were killed in the attack. On 21 June 2015, Al Jazeera reported that Israeli jets attacked targets in the mountainous areas. However, Hezbollah-affiliated Al-Manar reported that an Israeli drone crashed in the area, and that later an Israeli aircraft fired on it and destroyed the downed drone. On 10 May 2016, Israeli Air Force attacked a Hezbollah convoy which included six vehicles near the village as it made its way from Syria to Lebanon in the Qalamoun Mountains on the border with Syria. On 25 March 2018, Arabic media outlets reported that Israeli jets struck a number of Hezbollah positions along the Lebanon-Syria border. Lebanese al-Jadeed news reported the loud sounds heard by residents of the area were not explosions, but Israeli planes breaking the sound barrier, causing sonic booms. Hezbollah-affiliated Al Manar denied the reports and said that neither Hezbollah or the Syrian army were attacked by Israeli forces. On 6 October 2012, a UAV allegedly operated by Hezbollah from Lebanon was shot down by the Israeli Air Force near Yatir Forest. On 31 March 2018, An Israeli Hermes 450 drone crashed due to a technical failure. An additional Israeli drone bombed the crashed drone. The Lebanese Army issued a statement saying that the crashed drone was found to be equipped with four unexploded ordnance. A technical unit of the Lebanese Army detonated it. On 4 December 2013 A Hezbollah Commander, Hassan al-Laqqis was assassinated in Beirut. Israel denies any involvement. On 5 September 2014, the official Lebanese news agency reported that an Israeli surveillance device was detonated in the area of the village of Aadloun, in the Sidon area. According to the report, the device was planted in the garden and Hezbollah was the one who detonated it, with increased security measures in the background. On the Lebanese news website "Al-Nashra", however, it was claimed that an Israeli drone had detonated the device after it was discovered. Hezbollah-affiliated channels Al Mayadeen and Al-Manar claimed that a surveillance aircraft detonated the device from a distance. Since the civil war, Israel has routinely breached Lebanese airspace, waters, and borders, which is illegal since it violates Lebanon's territory and United Nations Security Council Resolution 425 and 1701. The most frequent breaches are overflights by Israeli war planes and drones; such violations have occurred since the inception of the Israeli–Lebanese conflict, and have happened continuously and almost daily since the 2006 Lebanon war, being the source of much conflict between Lebanon and Israel. Israeli warplanes sometimes stage mock attacks on Lebanese cities, and emit sonic booms that frighten civilians. In 2007 the Lebanese government complained that Israeli planes had flown into Lebanese airspace 290 times within four months, and that Israeli troops had crossed the border 52 times. In 2006 French Defense Minister Michele Alliot-Marie stated: "I remind that the violations of the airspace are extremely dangerous, they are dangerous first because they may be felt as hostile by forces of the coalition that could be brought to retaliate in cases of self defense and it would be a very serious incident." US officials on visit in Israel also demanded that Israel stop the overflights since they undermined the standing of Lebanese Prime Minister Fouad Siniora. On 19 August 2010, the Lebanese military reported that 12 aircraft belonging to the IDF entered into Lebanese territory, which they claim is a violation of Resolution 1701. In the three incidents, the IDF planes made circle maneuvers, fired no shots and left Lebanese airspace soon after. The UN has continuously protested the repeated Israeli overflights. Lebanese officials fear the escalation in overflights heighten tensions and could lead to war. Israel rejects such critisicm, and claim the overflights are necessary. In spite of this, a leaked US cable shows that Israel offered to stop such violations. On land, the Blue Line (Lebanon) is often crossed, as well as incursions into the Shebaa Farms (which Israel considers Israeli territory as part of Golan Heights, which it captured from Syria in 1967, but which Lebanon claims is Lebanese territory). The 2010 Israel–Lebanon border clash was also performed on the basis of claims of such violations. At sea, Israeli gunboats have shot into Lebanese territorial waters, and there have been Lebanese claims that Israel is breaching the law of the sea and might lay claim on Lebanese natural resources through the Tamar gas field. Hezbollah uses such violations as justification for the legimitacy of their continued armed resistance against Israel. ^ Washington Post, 16 November 1984. ^ a b Fisk, Robert (2001). Pity the Nation: Lebanon at War. Oxford University Press. pp. 255–257. ISBN 978-0-19-280130-2. ^ a b "The 1982 Israeli invasion of Lebanon: the casualties". Race & Class. 24 (4): 340–3. 1983. doi:10.1177/030639688302400404. ^ a b c d e f Humphreys, Andrew; Lara Dunston, Terry Carter (2004). Lonely Planet Syria & Lebanon (Paperback). Footscray, Victoria: Lonely Planet Publications. p. 31. ISBN 1-86450-333-5. ^ a b c Eisenberg, Laura Zittrain (Fall 2000). "Do Good Fences Make Good Neighbors? : Israel and Lebanon After the Withdrawal" (PDF). Middle East Review of International Affairs. Archived from the original (PDF) on 27 September 2011. Retrieved 1 October 2006. ^ a b Mor, Ben D.; Zeev Moaz (2002). "7". Bound by Struggle: The Strategic Evolution of Enduring International Rivalries. Ann Arbor: University of Michigan Press. p. 192. ISBN 0-472-11274-0. ^ "Timeline: Decades of Conflict in Lebanon, Israel". CNN. 14 July 2006. ^ Westcott, Kathryn (4 April 2002). "Who are Hezbollah?". BBC News. Retrieved 7 October 2006. ^ a b Hezbollah (16 February 1985). "An Open Letter to all the Oppressed in Lebanon and the World". Institute for Counter-Terrorism. Archived from the original on 4 October 2006. Retrieved 7 October 2006. ^ a b "Hezbollah celebrates Israeli retreat". BBC. 26 May 2000. Retrieved 12 September 2006. ^ a b "Factfile: Hezbollah". Aljazeera. 12 July 2006. Archived from the original on 27 August 2006. ^ a b "Israel, Hezbollah swap prisoners". CNN. 29 January 2004. ^ a b c "Report of the Secretary-General on the United Nations Interim Force in Lebanon (S/2006/560)". United Nations Security Council. 21 July 2006. Retrieved 26 September 2006. ^ "Report of the Secretary - General on the implementation of Security Council resolution 1701 (2006)". United Nations. Archived from the original on 22 December 2015. ^ Bickerton, Ian; Hill, Maria (2003). Contested Spaces: The Arab–Israeli Conflict. McGraw-Hill. pp. 43 (Cited from 1922 census figures quoted in Janowsky, 1975). ISBN 0-07-471217-9. ^ Katz, Sam (1988). Israeli Units Since 1948. Osprey Publishing. ISBN 0-85045-837-4. ^ United Nations General Assembly (29 November 1947). "United Nations General Assembly Resolution 181". Archived from the original on 29 October 2006. Retrieved 14 October 2006. ^ Karsh, Efraim (2002). The Arab–Israeli Conflict: The Palestine War 1948. Osprey Publishing. p. 27. ISBN 1-84176-372-1. ^ "Israel". Encarta Encyclopedia. Archived from the original on 1 November 2009. ^ United Nations Conciliation Commission for Palestine (23 October 1951). "General Process Report and Supplementary Report Covering the period from 11 December 1949 to 23 October 1950". New York: United Nations. Archived from the original on 28 June 2006. Retrieved 18 September 2006. ^ United Nations Special Committee on Palestine (3 September 1947). "Recommendations to the General Assembly, A/364". UNSCOP. Retrieved 14 October 2006. ^ Chatty, Dawn; Hundt, Gillian Lewando (2005). "1". Children of Palestine: Experiencing Forced Migration in the Middle East. New York, Oxford: Berghahn Books. p. 11. ISBN 1-84545-120-1. ^ a b c d e f g Peetet, Julie M. (December 1997). "Lebanon: Palestinian refugees in the post-war period". Le Monde diplomatique. Retrieved 1 October 2006. ^ Inventory of Conflict & Environment Case Studies, ": Jordan River Dispute". Washington, D.C.: American University. November 1997. Retrieved 12 September 2006. ^ a b Winslow, Charles (1996). Lebanon: War and Politics in a Fragmented Society. London and New York: Routledge. p. 151. ISBN 0-415-14403-5. ^ a b Fisk, Robert (2002). "3". Pity the Nation: The Abduction of Lebanon. New York: Thunder's Mouth Press / Nation's Books. p. 74. ISBN 1-56025-442-4. ^ "Black September in Jordan 1970–1971". Armed Conflict Events Database. 16 December 2000. Retrieved 15 September 2006. ^ Nisan, Mordechi (2003). The Conscience of Lebanon: A Political Biography of Ettiene Sakr (Abu-Arz). London, Portland, Oregon: Frank Cass. p. 20. ISBN 0-7146-5392-6. ^ "Lebanon: Refugees and internally displaced persons". The CIA World Factbook. 8 August 2006. Retrieved 16 August 2006. ^ "Palestine Liberation Organization (PLO)". Jewish Virtual Library. Retrieved 20 October 2006. ^ Smith, Charles D. (2001). Palestine and the Arab Israeli Conflict (paperback). Boston: Bedford/St. Martin's. p. 354. ISBN 0-312-20828-6. ^ a b Kjeilen, Tore. "Lebanese Civil War". Encyclopaedia of the Orient. Retrieved 14 September 2006. ^ Bureau of Near Eastern Affairs (October 2005). "Background Note: Syria". U.S. Department of State. Retrieved 15 September 2006. ^ a b c Federal Research Division (June 2004). Lebanon: A Country Study. Kessinger Publisher. p. 214. ISBN 1-4191-2943-0. ^ Deeb, Marius (July 2003). Syria's Terrorist War on Lebanon and the Peace Process. Palgrave McMillian. p. 39. ISBN 1-4039-6248-0. ^ Rubenberg, Cheryl A. (February 1989). "5". Israel and the American National Interest: A Critical Examination (Paperback). University of Illinois Press. p. 227. ISBN 0-252-06074-1. ^ a b Fisk, Robert (2002). Pity the Nation: The Abduction of Lebanon. New York: Thunder's Mouth Press / Nation's Books. p. 126. ISBN 1-56025-442-4. ^ "Lebanon – UNIFIL Background". United Nations. 2005. Archived from the original on 16 July 2006. Retrieved 14 July 2006. ^ "Timeline: Lebanon". BBC News. 15 June 2006. Retrieved 15 September 2006. ^ Isseroff, Ami. "Draft Agreement between Israel and Lebanon (Introduction by author)". MidEastWeb. Retrieved 14 September 2006. ^ Kelly, James (8 August 1983). "A House Divided: Hope grows dimmer for unifying Lebanon". Time. Retrieved 15 September 2006. ^ a b Bureau of Near Eastern Affairs (August 2005). "Background Note: Lebanon". U.S. Department of State. Retrieved 15 September 2006. ^ a b c d e Michael Brecher, A Study of Crisis, University of Michigan Press 1997 p.299. ^ "Cease-fire understanding in Lebanon, and remarks by Prime Minister Peres and Secretary of State Christopher". Israeli Ministry of Foreign Affairs. 26 April 1996. Archived from the original on 10 March 2007. Retrieved 14 October 2006. ^ Segal, Naomi (4 February 2000). "Hezbollah kills 3 Israeli soldiers, veteran SLA leader in Lebanon". The Jewish News Weekly of Northern California. Jerusalem. Jewish Telegraphic Agency. Retrieved 15 September 2006. ^ Immigration and Nationality Directorate (October 2001). "Country Assessment" (PDF). United Kingdom Home Office. Archived from the original (PDF) on 21 September 2006. Retrieved 14 September 2006. ^ Karam, Zeina (6 September 2006). "Hezbollah Defines Its Political Role". Washington Post. Associated Press. Retrieved 3 October 2006. ^ "Israelis Held by the Hizbullah - October January 20, 200004". mfa.gov.il. ^ "Israel, Hezbollah swap prisoners". CNN. 29 January 2004. Retrieved 5 May 2010. ^ "Israeli jets hit Lebanon targets". BBC News. 20 January 2004. Retrieved 13 July 2006. ^ Butcher, Tim; David Blair (17 August 2006). "Lebanese troops will not disarm Hizbollah". The Daily Telegraph. London. Retrieved 6 September 2006. ^ "Security Council Notes Significant Progress in Lebanon". United Nations Security Council. 23 January 2006. ^ "Hezbollah rejects call to disarm". ABC (AU). 27 April 2005. Archived from the original on 8 March 2008. Retrieved 8 September 2006. ^ "Timeline: Decades of conflict in Lebanon, Israel". CNN. 14 July 2006. Retrieved 16 September 2006. ^ Klein, Aaron (29 May 2006). "Syria, Iran directed rocket barrage against Israel". World Net Daily. Retrieved 14 August 2006. ^ a b c Blanford, Nicholas (15 June 2006). "Lebanon exposes deadly Israeli spy ring". The Times. London. Retrieved 14 August 2006. ^ "Lebanon arrests key suspect in Islamic Jihad assassination". Ya Libnan. 11 June 2006. Archived from the original on 11 November 2006. Retrieved 18 October 2006. ^ "Murr: Israeli aircraft detonated the car bomb in Sidon". Ya Libnan. 16 June 2006. Archived from the original on 11 November 2006. Retrieved 18 October 2006. ^ Harel, Amos (13 July 2006). "Hezbollah kills 8 soldiers, kidnaps two in offensive on northern border". Haaretz. Retrieved 20 October 2006. ^ "Hezbollah Raid Opens 2nd Front for Israel". The Washington Post. 13 July 2006. Retrieved 20 October 2006. ^ "Press Conference with Hasan Nasrallah". UPC. 26 July 2006. Archived from the original on 17 November 2006. Retrieved 20 October 2006. ^ "Country Report—Lebanon," The Economist Intelligence Unit, no. 4 (2006), pp. 3–6. ^ "Report of the Commission of Inquiry on Lebanon pursuant to Human Rights Council resolution S-2/1, p. 26" (PDF). United Nations General Assembly. 23 November 2006. Archived from the original (PDF) on 17 June 2013. Retrieved 12 July 2007. ^ "Lebanon Under Siege". Presidency of the Council of Ministers - Higher Relief Council (Lebanon). 9 November 2006. Archived from the original on 27 September 2006. Retrieved 30 August 2008. ^ "Let's face it: Israel's refugees (in Hebrew)". Walla News. 10 August 2006. Archived from the original on 19 February 2008. ^ Pannell, Ian (9 September 2006). "Lebanon breathes after the blockade". BBC News. Retrieved 9 September 2006. ^ Macleod, Hugh (25 November 2007). "Hezbollah recruits thousands in Lebanon crisis". Telegraph (UK). London. ^ Greenberg, Hanan (7 February 2007). "IDF, Lebanese army exchange fire on northern border". ynet. Retrieved 9 April 2007. ^ Avni, Benny (9 February 2007). "U.N.'s Ban Veers From Standard Line on Israel". New York Sun. Retrieved 9 April 2007. ^ "Israeli soldiers in Israel during clash: U.N." Reuters. 4 August 2010. ^ "Lebanon: We Fired First at IDF Unit Near Israel Border". Haaretz. Retrieved 9 September 2016. ^ "UN: Israel did not cross border". Al Jazeera. Retrieved 9 September 2016. ^ "Lebanon-Israel border incidents could quickly turn to war: U.N." 2 August 2011. Retrieved 4 August 2017. ^ Pfeffer, Anshel (2 August 2011). "IDF Exchanges Fire With Lebanon Across Border". Retrieved 4 August 2017 – via Haaretz. ^ "Soldier killed by Lebanese sniper laid to rest". Retrieved 4 August 2017. ^ "Israeli soldiers wounded in Lebanon incursion". www.aljazeera.com. Retrieved 4 August 2017. ^ "Border explosion sparks multiple theories". 8 August 2013. Retrieved 4 August 2017. ^ "מטען הופעל בגבול לבנון, צה"ל תקף מוצב חיזבאללה". Walla!. 14 March 2014. ^ "Blast wounds three Israeli soldiers near Syria border". Syrian Observatory for Human Rights. 18 March 2014. ^ "Two Israeli soldiers killed in Hezbollah missile attack". Al Jazeera. 28 January 2015. Retrieved 29 January 2015. ^ "Militants fire 2 rockets from Lebanon at Israel's north, first since last year's war". International Herald Tribune. 17 June 2007. Retrieved 17 June 2007. ^ "המודיעין הצבאי הסורי, חיזבאללה, וארגון 'אנסר אללה', ביצעו את ירי הקטיושות על קריית שמונה. הפגזות נוספות בדרך". Debkafile. 17 June 2007. ^ "המודיעין הצבאי הסורי, חיזבאללה, וארגון 'אנסר אללה', ביצעו את ירי הקטיושות על קריית שמונה. הפגזות נוספות בדרך". Ynet. 11 September 2009. ^ "קטיושות נורו מלבנון לשטח ישראל". Walla!. 29 November 2011. ^ "Israeli jets reportedly strike arms shipment en route to Hezbollah". The Times of Israel. 24 February 2014. ^ "Israel bombs Hezbollah target on Lebanon-Syria border". Syrian Observatory for Human Rights. 25 February 2014. ^ "Israel bombed Hezbollah's target on Lebanese-Syrian border". Syrian Observatory for Human Rights. 25 February 2014. ^ "Israel strikes area on Lebanon-Syria border". Syrian Observatory for Human Rights. 28 February 2014. ^ "Watch: Hezbollah says Lebanon blast was Israel destroying its own crashed drone". The Jerusalem Post. 22 June 2015. ^ "דיווח: חיל האוויר תקף שיירת חיזבאללה בגבול סוריה-לבנון". NRG. 10 May 2016. ^ "Reports say Israeli jets hit Hezbollah positions along Syria-Lebanon border". The Times of Israel. 25 March 2018. ^ Azrael, Guy (7 October 2012). "Israel eyes Lebanon after drone downed". CNN. Archived from the original on 5 May 2014. Retrieved 5 April 2013. ^ "Israeli drone crashes in Lebanon due to malfunction". The Times of Israel. 31 March 2018. ^ "Hezbollah says commander killed in Beirut, blames Israel". Retrieved 4 August 2017. ^ קייס, רועי (9 May 2014). ""פעיל חיזבאללה נהרג מפיצוץ מתקן ישראלי"" – via Ynet. ^ "Security Council Extends Unifil Mandate for Six Months, to 31 January 2002". Unis.unvienna.org. Retrieved 14 March 2011. ^ "UN Questions Usefulness of Peacekeepers - Security Council - Global Policy Forum". Globalpolicy.org. 30 July 2002. Retrieved 14 March 2011. ^ ":Middle East Online ميدل ايست أونلاين:". Middle-east-online.com. 30 November 2007. Retrieved 14 March 2011. ^ Associated, The (2 April 2008). "Lebanese army: 12 IAF jets fly over Beirut, Lebanese areas". Haaretz. Retrieved 14 March 2011. ^ "Israeli planes create sonic boom confusion over Lebanon". BBC News. 9 December 1998. Retrieved 14 March 2011. ^ Pinkas, Alon (22 January 2007). "Report: IAF jets emit sonic booms over s. Lebanon". The Jerusalem Post. Retrieved 14 March 2011. ^ Ravid, Barak. "Lebanon to UN: Israel breached truce deal hundreds of times". Haaretz. Retrieved 14 March 2011. ^ "France calls IAF overflights in Lebanon 'extremely dangerous'". Haaretz. 2 April 2008. Retrieved 14 March 2011. ^ Benn, Aluf (2 April 2008). "U.S. officials demand IAF cease overflights in Lebanese airspace". Haaretz. Retrieved 14 March 2011. ^ "12 Israeli warplanes violate Lebanese airspace". The Daily Star. 19 August 2010. Retrieved 8 April 2014. ^ Section, United Nations News Service (11 January 2010). "UN News - Lebanon: UN again protests against Israeli over-flights". UN News Service Section. Retrieved 4 August 2017. ^ Section, United Nations News Service (11 October 2004). "UN News - UN envoy 'seriously concerned' over Israeli violations of Lebanese airspace". UN News Service Section. Retrieved 4 August 2017. ^ "Israeli overflights 'dangerous situation' - Lebanon". Jordan Times. 11 February 2010. Retrieved 14 March 2011. ^ "Israel's incessant overflights heighten Lebanon tensions". Lebanonwire.com. 26 February 2010. Archived from the original on 13 July 2011. Retrieved 14 March 2011. ^ Teeple, Jim (23 October 2006). "Israel Continues Overflights of Lebanon". Globalsecurity.org. Retrieved 14 March 2011. ^ "Petraeus Visit Highlights Growing Strategic Prominence of Lebanon - August 7, 2008 - The New York Sun". Nysun.com. 7 August 2008. Retrieved 14 March 2011. ^ "Spotlight - Israel offered to cease overflights for US intel". The Daily Star. 6 December 2010. Retrieved 14 March 2011. ^ "Israeli army vehicles cross Blue Line into Lebanon". 15 June 2011. Retrieved 4 August 2017. ^ "Israel again violates Lebanese air space, enters Shebaa Farms". The Daily Star. 29 December 2010. Retrieved 14 March 2011. ^ "Israel-Lebanon border clash kills five people". BBC News. 3 August 2010. ^ "Israeli gunboat fired shots toward Lebanese waters". NOW Lebanon. 7 August 2010. Retrieved 14 March 2011. ^ Bassam, Laila (10 January 2011). "Lebanon says Israel gas search violates sea border". Reuters. Retrieved 14 March 2011. ^ "Oil, gas discoveries, a potential Israel-Lebanon conflict". Ya Libnan. LB. 2 November 2010. Retrieved 14 March 2011. ^ "Report: Israel stealing Lebanese gas - Israel News, Ynetnews". Ynetnews.com. 20 June 1995. Retrieved 14 March 2011. ^ "Israel and Hizballah Ready to Rumble?". Time. 1 August 2008. Israel-Lebanon Offshore Oil & Gas Dispute – Rules of International Maritime Law Martin Waehlisch, ASIL Insight (American Society of International Law), Vol. 15, Issue 3, Dec. 5, 2011. This page was last edited on 20 April 2019, at 06:47 (UTC).